Fries are one of those foods that are so delicious we can’t help but speak of them like drugs. They are an addiction, rather than a passion. (Considering their brain-rewarding combo of salt and fat, it’s not a bad comparison.) “Do you want fries with that?” should probably be included in every English phrasebook for travelers visiting the U.S. There’s a National French Fries Day (for those who keep up with obscure food holidays). And it’s an international love: Poutine is considered one of Canada’s unofficial national dishes. Belgium has a history of fries on its tourism website. 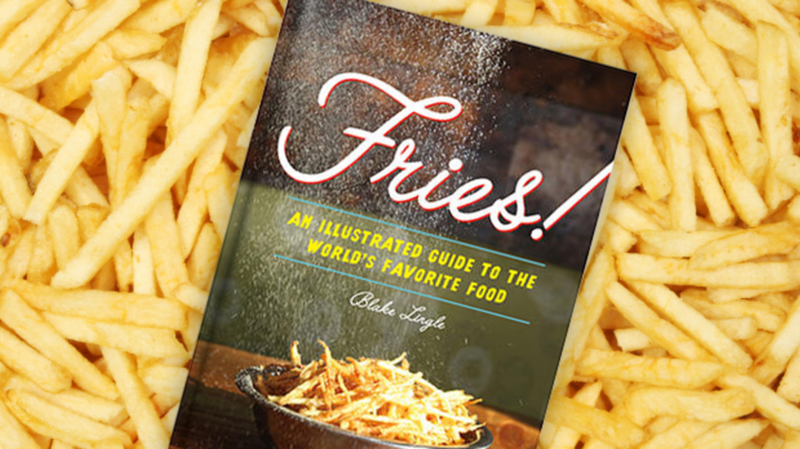 In his forthcoming book Fries: An Illustrated Guide to the World’s Favorite Food, fry entrepreneur and Boise Fry Company cofounder Blake Lingle dives into the history and state of the fry around the world. Here are nine facts we gleaned from his fritespertise. 1. BELGIANS EAT MORE FRIES THAN ANYONE ELSE. Belgium consumes more fried potatoes per capita than any other country—some 165 pounds a person annually, according to 2010 statistics. By contrast, the average American eats 48 pounds of all varieties of potato over the course of a year (though the USDA reports that fries play a major role in making potatoes the country’s most popular vegetable). 2. THOMAS JEFFERSON BROUGHT FRIES TO AMERICA. Thomas Jefferson probably first encountered sliced, fried potatoes while serving as the American ambassador to France, where fries have been enjoyed since at least 1760. He would go on to detail a recipe in his writings sometime between 1801 and 1809. According to Lingle’s research, this is one of the earliest fry recipes known. Jefferson used the French verb frire, to deep fry, rather than the word for pan-frying, bolstering his claim to the title of Founding Father of American Fries. 3. ONE COMPANY MAKES A THIRD OF THE WORLD’S FRIES. McCain Foods is the world’s largest producer of frozen fries, those cooked in factories and then reheated in restaurants and homes. One in three fries in the world comes from McCain. 4. THERE ARE FRY VENDING MACHINES. A company executive demonstrates a fry vending machine on its installation in Brussels in 2013. Photo courtesy Getty Images. In the 1990s, Ore-Ida Foods had more than 300 vending machines that could make a piping-hot serving of fries in less than a minute using hot air. French fry machines are still around, though we couldn’t find any contemporary mentions of an Ore-Ida machine. Belgian grocery stores are home to a machine that will fry your potatoes in beef fat and spit them out in 90 seconds. Another prototype fry vending machine was launched at a Dutch university in 2015. 5. FRIES AREN’T ENTIRELY UNHEALTHY. A few studies have found that frying potatoes in oil increases the amount of antioxidants in the dish. Antioxidants probably won’t save you from obesity-related health issues, but it’s not the worst excuse to indulge in a frite snack every once in a while. 6. THE FIRST FAMILY LOVES THEM. Barack Obama is known to take fellow world leaders for burgers and fries in D.C. Occasionally he even offers constituents fries from his own plate. (He reportedly has a penchant for Five Guys.) As part of her healthy eating initiative, Michelle Obama vowed to “take a break” from fries in 2014, after calling them her favorite food in a 2009 interview. 7. FAKE FRIES MAKE REAL MONEY. In 1990, artist Stefan Bohnenberger exhibited a gold-cast sculpture depicting two crossed French fries, calling it Pommes d’Or. In 2012, a gallery lost the two regular fries used as models for the golden sculpture, and Bohnenberger successfully sued for 2000 euros (then worth about $2650). Even non-gold fry replicas are valuable. In 2005, McDonald’s auctioned off a prop fry designed to resemble Abraham Lincoln that had appeared in a Super Bowl commercial that year. (Yeah, imagine how the latest viral ad campaign is going to sound in 10 years.) It ended up selling for $75,000, which was donated to Ronald McDonald House Charities. 8. THE EUROPEAN SPACE AGENCY HAS TESTED HOW FRIES WOULD FARE IN SPACE. In a 2014 study, a pair of Greek researchers teamed up with the ESA to test how gravity affects deep frying. Using a centrifuge, they found that as gravity gets stronger, fries get crispier. The perfect crispy fry would be made at three times Earth’s gravity. Sadly for the astronauts on the International Space Station, the research indicates that fries in microgravity would be soggy and awful. 9. THERE’S AN ODE TO FRIES.